Audi’s new 292-hp TTS coupe enters its third-generation for 2017 with more refinement, efficiency, and performance. It’s hard to believe that Audi has been delivering the innovative TT line of automobiles to our shores for the better part of two decades, but the third generation car emerges with new levels of refinement, performance, and efficiency. Styling is familiar, albeit carefully sculpted to improve aerodynamics and give the car cues more in line with its pretty stable mates. The new car is slightly shorter and narrower than the outgoing car, and it has been designed to ride lower and features a longer wheelbase. The overall look is more aggressive than that of previous iterations, but manages to convey this sporty image without the addition of excess aero bits, vents, and spoilers. The car benefits from all new LED lighting front and rear, and TTS exclusives include silver mirror caps and quad exhaust pipes to maximize curb appeal. On the inside you will find seating for four, although the rear compartment is best reserved for those of smaller stature with small feet, but the two front positions offer abundant leg-, hip-, and headroom for all but the tallest individuals. Rearward visibility isn’t great, but some practicality has to be sacrificed in the name of beauty. Our test unit featured the Driver Comfort Package which includes front and rear parking sensors, a rear view camera, and Audi side assist (blind spot indicator) to help alleviate some of the visibility issues. The cabin design is clean and uncluttered, and the overall quality of the fit-and-finish is impressive. You immediately notice that the dash layout has been simplified to the point that there are very few buttons, screens and switches visible. In fact, even the HVAC controls have been incorporated into the vents themselves! Audi buyers tend to be tech savvy, so the TTS has been blessed with the introduction of one of the slickest instrument clusters to ever grace an automobile. The virtual cockpit features a stunning, high-visibility screen measuring 12.3-inches across, which effectively replaces a multitude of analog gauges, LCD screens and traditional meters. At the touch of a button the operator can completely alter this colourful display to best suit their needs, cycling between speedometer and tachometer information as well as navigation, infotainment, and camera functions. Taking in vital information is quick and efficient, as the screen is bold, bright and ultra-sharp. Audi’s Multi-Media Interface (MMI) has been revamped to be more intuitive, and latest version greatly simplifies the operation of the navigation, radio, phone and media devices that comprise the virtual cockpit user screen. The TTS is a driver’s car, so it comes fitted with a turbocharged 2.0-litre TFSI inline four-cylinder engine that produces a healthy 292-horsepower and 280 ft.-lb of torque which is distributed as needed to all-four wheels via Audi’s proven quattro all-wheel-drive system. The car features the ultra-quick, dual-clutch, 6-speed S-tronic automatic transmission which comes with launch control, a bit of engineering wizardry which helps the car sprint from 0 to 100 km/h in a mere 4.9 seconds. Easy to reach paddle shifters make the act of traipsing through the gearbox effortless and instinctive as you go hunting for apexes on back country roads. Also on board is the Audi drive select system which allows the driver to select from four individual driving modes – comfort, auto, dynamic or individual – to adjust the car’s performance and handling characteristics to best suit road and weather conditions, as well as the driver’s intent. To further enhance the car’s comfort and handling the TTS features Audi’s three mode magnetic ride system, which automatically adjusts the firmness of the dampers to suit the current driving situation. This clever system has three modes – auto, comfort or dynamic – which can also be manually selected by the driver using the aforementioned Audi drive select system. At the touch of a button the operator can completely alter this colourful display to best suit their needs, cycling between speedometer and tachometer information as well as navigation, infotainment, and camera functions. Handling is competent and the car likes to be tossed into corners where it exhibits just a hint of body roll at higher speeds. The ride is stiff, but comfortable, and when dynamic mode is selected the driver is able to read the car’s intentions through the steering wheel and seat. Steering feel is light, but its action is precise, and the oversized disc brakes deliver phenomenal stopping power. The TTS represents the perfect package for those individuals who appreciate distinctive styling, embrace technology, and truly relish the act of driving. Price as tested: $69,090 (Includes Sepang Blue Pearl paint – $890; 20-inch 10-Y spoke wheels -$800; navigation package – $1,800; red brake calipers – $400; Driver Comfort Package – $ 1,400; pneumatic side bolsters – $300; Audi Lane Assist – $650; B&O sound system – $950; freight – $2,095. This post All-New 2017 Audi TTS Review: More Efficient, Extra Performance appeared first on TractionLife.com by Russell Purcell. Audi’s new SQ5 will get a nice bump in power all thanks to some nifty electronics under the hood. This isn’t the Ebay electric turbo charger you saw floating around promising 100 extra horsepower. This is in fact an electric compressor that forces air into the cylinders that results in a 30hp bump putting the SQ5 at 365hp utilizing Audi’s 3.0L diesel engine. The electric blower is a 48V electric forced induction system which generates power as quickly as 250 milliseconds. The beauty of this system is it is electrically driven, unlike a traditional turbo system which relies on moving exhaust gases to power a turbine. The benefit is essentially zero turbo lag which is used to fill in the power band in the lower rpm range. The all new SQ5 is scheduled to appear before the public in April of 2017. North Americans will have to wait to see if the SQ5 will actually make it onto our shores, and specifically whether the diesel engine will be an optional power plant given all the diesel controversy here. For 2017, Audi refreshed a few models within their lineup. Although the changes aren’t huge, it is enough to bring some new life into their cars. For 2017 the A6 3.0T gets a new Competition Package that boosts power on the 3.0L supercharged V-6 340 hp and 325lb/ft of torque. Adding to the performance side of things, the Competition Package also comes with a rear limited slip differential. The inside gets custom diamond stitched leather seats and the exterior gets new 20 inch wheels. On the standard end, the A6 2.0T and 3.0T comes standard with S line trim. The 2017 A7 3.0T will also receive the Competition Package treatment with similar features within the package to the A6. Audi will also be bringing the RS7 Performance model to the U.S. 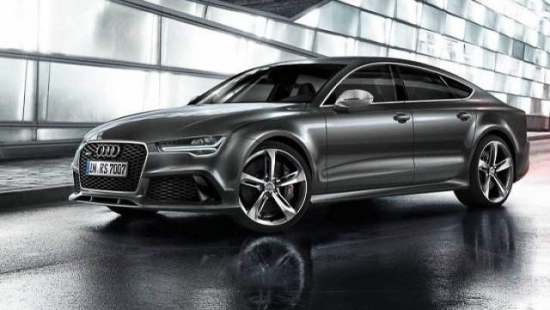 The RS7 Performance model offers 605 hp and 560lb/ft of torque from its 4.0L twin-turbo V-8. That’s a 45hp jump over the regular RS7. 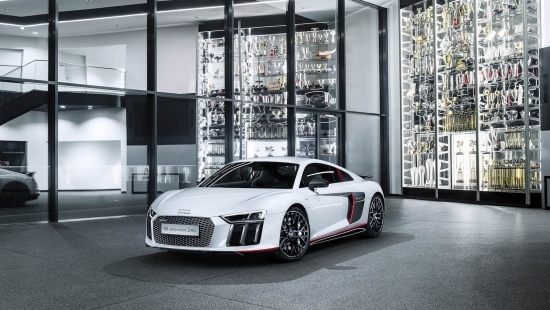 To celebrate the R8 LMS GT3’s victory at the Nurburgring 24 Hours, Audi built a special edition R8 simply called the Audi R8 V10 Plus Selection 24H. Much of the design elements for the limited edition car is carried over from the race car including front splitters, wing mirrors, engine compartment cover, rear wing and rear diffuser all made up in light weight carbon fiber. The menacing looks of the car continues with all chrome trim being blacked out. The race inspiration design continues into the cabin with ample amounts of carbon fiber being used. Interesting enough, through all of the performance oriented design, Audi can’t help themselves but to throw in some luxury element like the entry lights which project the R8 logo on the road surface. The car will get some suspension tweaks in the form of adaptive damper control via magnetic shocks, and a dynamic steering system. The rest of the cars mechanics have been left pretty much as Audi intended. 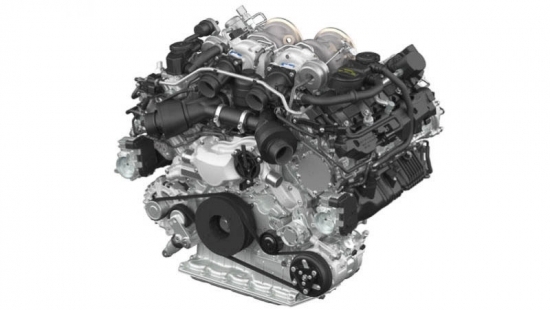 Porsche took to the 2016 International Vienna Motor Symposium to debut an all new twin turbo V8 powerplant. Rumor has it that this motor will make its first production debut under the hood of the Panamera. The engine will likely see play time in Audis, Bentleys and Lamborghinis in the future as well. Porsche’s new engine will utilize new technology such as cylinder deactivation to help drive up fuel efficiency and should yield 30% less consumption than the outgoing motor. The V8 will still generate 549 hp and 567 lb/ft of torque. Sharing engines across various companies will help manage production costs and allow scalability for each manufacturer to more efficiently bring new vehicles to the market. 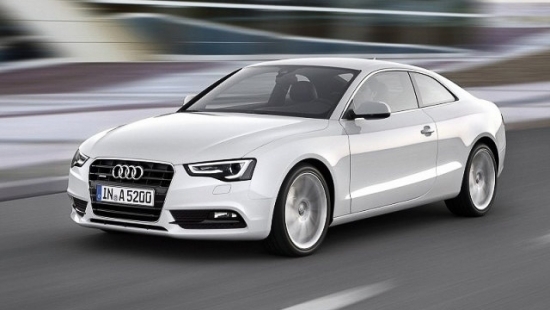 Audi released their A5 coupe to the world back in 2008 and the 8 years its been in production is starting to take a tool on its once good looks. Don’t get me wrong, the A5 is still a beautiful car, and its aging gracefully, but aging nonetheless. So Audi fans have been anxiously waiting for the next generation A5 to make its debut which is said to be June 2 in Ingolstadt, Germany. The new Audi A5 will be built on the new MLB Evo platform which will be lighter and more rigid than the previous platform. With a combination of aluminum and high-strength steel, the new platform will help control weight and at the same time offer better handling characteristics for the next generation car. 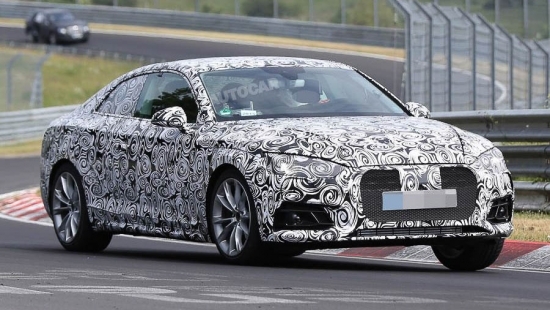 The car to debut on June 2 will likely be the coupe variant but we should expect to see a convertible and sportback version of the A5 to follow not too long after. 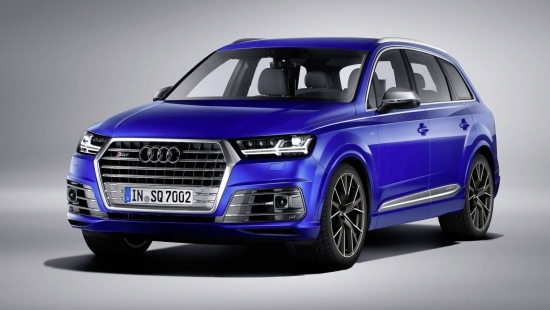 Audi SQ7 TDI to Land Stateside? Audi’s all new SQ7 TDI has so far only been destined for the European market. However, with the SUV market in North American in considerable growth mode, it leads one to think that Audi would want to capitalize on that market and bring more SUV offerings to their Canadian and US customers. Although no official word yet from Audi, we can only at this point continue our wishful thinking and hope that the SQ7 TDI one day gets announced for its transatlantic journey. Despite all the bad press around diesel vehicles lately, what makes the SQ7 TDI a highly sought after SUV is that it gives fuel economy like a diesel vehicle, but it packs the performance of its gasoline counterparts. The SQ7 packs in a 435hp and a staggering 664lb/ft of torque. That type of power allows the SQ7 TDI to sprint to 100km/h in just 4.8 seconds. Compare that to the gasoline version of the competition like the X5 M who runs a 4.2 second 100km/h burst or the GLS63 clocking in at 4.6 seconds, the SQ7 TDI all of a sudden becomes a contender in a space you wouldn’t have thought it would be in. With no official pricing released for North America, one could surmise that after exchange and taxes the SQ7 TDI should work out to roughly $86,000 USD, which puts it in a very competitive price point for consumers. Lets just put it right out there, the all new Audi A4 long body will not be landing in Canada any time soon. 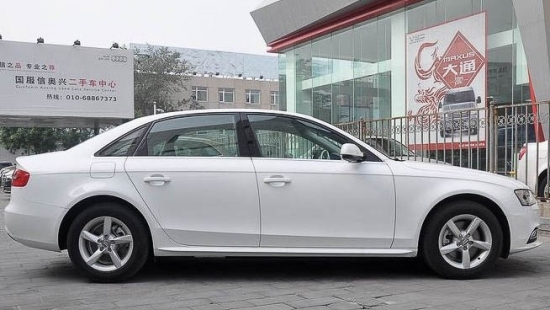 It is a car Audi designed and launched for the Chinese market. The A4 is a well selling vehicle, but for those who want a little more space without jumping to an A6, the A4 long is a good option. The car has been extended by a total of 15.8 feet which is an extra 1.6 inches over the previous generation A4L. The A4L can be purchased with the gloss package which takes the luxury elements up a notch with more chrome trimming, and a new front grille. The longbody A4 will still utilize a 2.0L four-cylinder turbo engine that’s good for either 188hp or a peppier 248hp model. 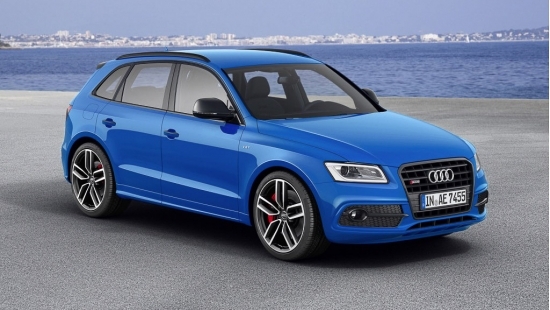 Audi will package the A4L with their seven speed S Tronic DSG transmission. The long wait for Audi’s new TT is now over, or more precisely, the TT RS. 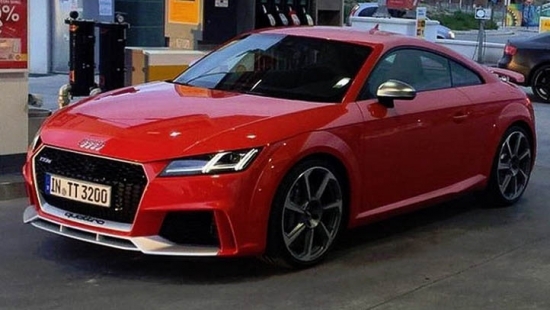 Spy photos of the TT RS has been floating around the internet for a while now, but the covers were finally pulled off the production car at the Beijing Auto Show. The latest generation TT RS will be utilizing a tuned 5 cylinder turbo motor good for 400hp and 354lb/ft of torque. Power is delivered to all four wheels and allows the TT RS to sprint to 100km/h in a mere 3.7 seconds. The TT RS receives an all new aero package as well. The front bumper has been beefed up with larger intakes, and an integrated lower splitter. The fender lines have been flared out but maintains an aggressive overall stance. The rear decklid has a fixed rear wing. We can’t wait to see these cars hit the show room floor which should be some time next year. Pricing should start around the $55,000USD range.